Coleraine defender David Ogilby dedicated his equaliser against Crusaders to former Institute first team coach Wesley Gregg. Gregg, who worked at Drumahoe under John Gregg’s management, was Oran Kearney’s coach at the Showgrounds before he tragically died in May 2015. 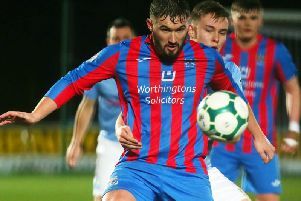 The centre-back fired home a free-kick to earn the Bannsiders a point and stated on Facebook that he was dedicating the goal to his former coach.